LebTown, an independent media organization in Lebanon, Pennsylvania, has discovered Digital Commonwealth – big time! 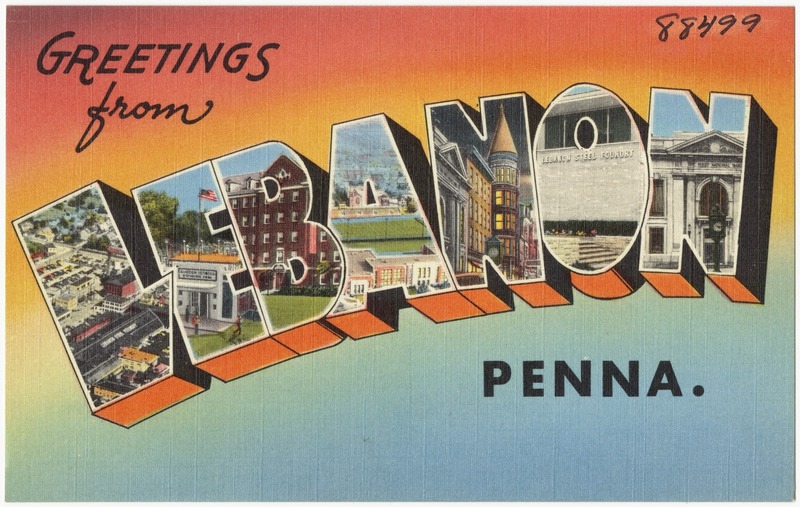 In a posting entitled, Wish You Were Here: Lebanon County postcards of decades past, LebTown uses over 20 postcards from the Boston Public Library’s Tichnor Brothers Collection. 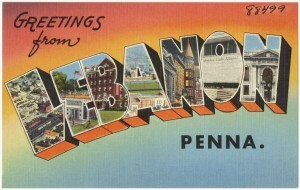 This collection includes approximately 25,000 office proof postcards from across the United States. LebTown, naturally, has extracted many postcards of interest to residents of Lebanon County. They advise any viewers to go to “Massachusetts Digital Commonwealth” for postcards for the rest of Pennsylvania and “other states”. If you need a little inspiration for planning your vacation this summer, Tichnor Brothers concentrated on views of vacation spots. Take a look at California, the Grand Canyon, or Vacationland itself, Maine. 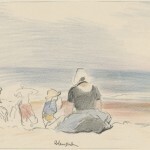 In February, the Boston Public Library was in an artistic frame of mind, adding to the American Artists collection as well as adding two new collections: Frank W. Benson (1862-1951) Prints and Drawings and Joseph Pennell (1857-1926) Prints and Drawings. 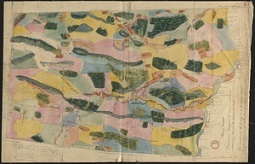 If you’re not in an artistic mood, the Harvard Forest Archives has added hundreds of maps. 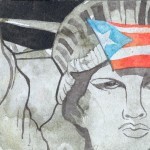 Holyoke Community College has uploaded the Frank N. Fowler Postcard Collection. 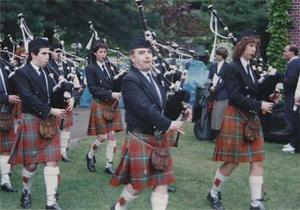 The largest addition this month was the harvest of 1,230 items from Wheaton College’s Marion B. Gebbie Archives Image Collection, including the bagpipers at left. Parade season is right around the corner. Time to get your kilts from the dry cleaners. American companies took notice when French art posters became extremely popular in the 1880’s. 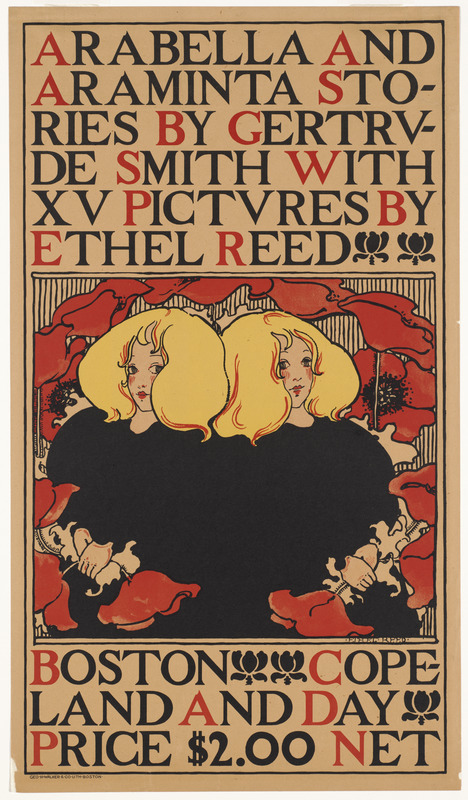 A new lithography process had made economical printing of large editions of posters possible. American companies commissioned prominent illustrators like Edward Penfield, Will Bradley, Ethel Reed and Maxfield Parrish to create posters. There is no denying the purpose of the posters was to advertise performances, exhibits, magazines, books and other products to a growing middle class. If it also brought art to everyday life, so much the better. And so the American Art Poster entered its golden age, 1890-1920. 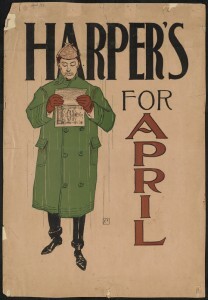 Edward Penfield’s poster advertising the April 1893 Harper’s magazine (above, far left) is generally credited as starting an American poster revolution. Unlike previous American posters, this one advertised intellectual – not commercial – product. It also was much more restrained and simpler than the French posters of the time. Penfield included his monogram on this poster. Later, Penfield and the other illustrators would sign their full names and printers would add their company names. 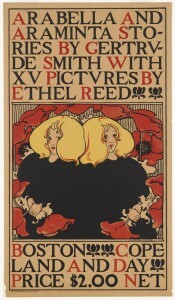 Penfield’s posters also set the precedent of doubling as magazine (or book) covers. 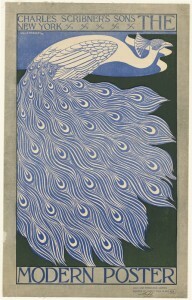 Will Bradley’s beautiful Art Nouveau peacock (above, center left) is a change from his frequent depictions of women in windblown gowns. However, it demonstrates the color intensity and textural effects possible with the new lithographic process. This image also demonstrates the influence of Japanese block printing on the Boston-born Bradley. Maxfield Parrish’s Daybreak painting would go on to become the most popular art print of the 20th century. In contrast to the saturated colors of his paintings, Parrish started out with black and white commercial art. Some of those ads and Harper’s Weekly covers are here. 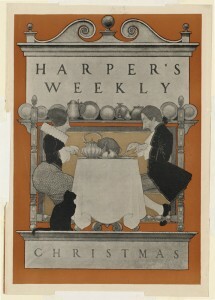 The charmingly domestic Harper’s Weekly Christmas cover (above, far right) includes a color background for its black and white image. With over 500 images, the Boston Public Library’s American Art Posters 1890-1920 is a collection you can visit and revisit, discovering new favorites each time. January was a busy month for Digital Commonwealth, in no small part due to the New Bedford Public Library adding 4 new collections and substantially increasing two existing collections. All six include photographs that depict New Bedford’s varied history. 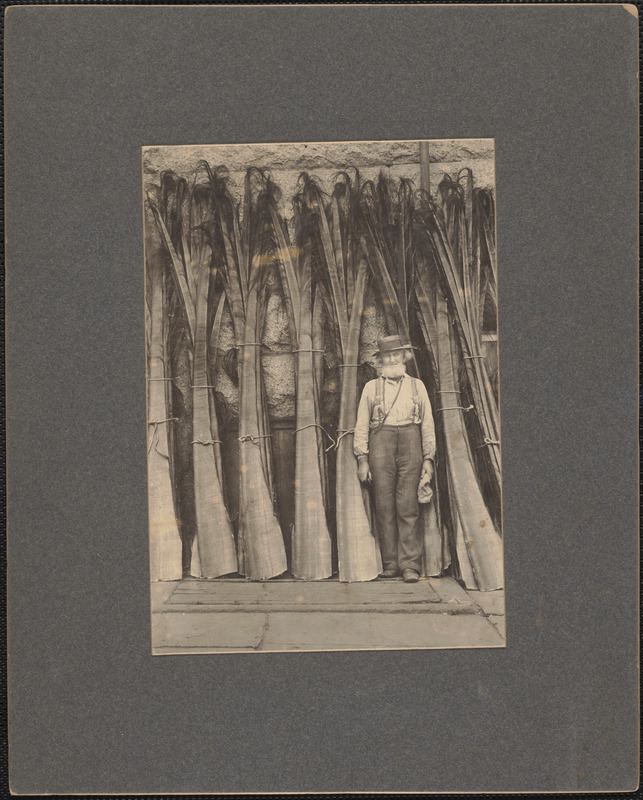 The photo of Frank Lewis with baleen bundles (left) from the Earl D. Wilson Collection Photographs speaks to New Bedford’s whaling history. 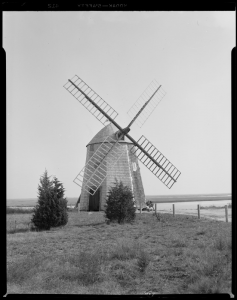 Another substantial collection is the Barnstable Patriot Photograph Collection from Cape Cod Community College. This collection spans nearly 50 years of Barnstable and nearby Cape towns. 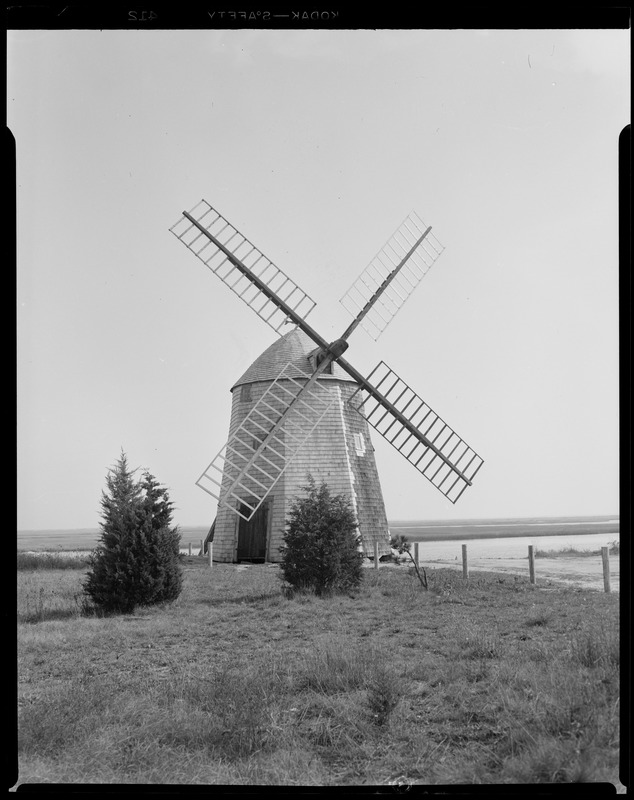 The charming windmill (below) is one of many Cape views you can find in this collection. The Patriot Ledger (Quincy, MA) headlined its A GOOD AGE column on January 21, 2019, “Discovering a 20th Century Boston ‘camera man’“. 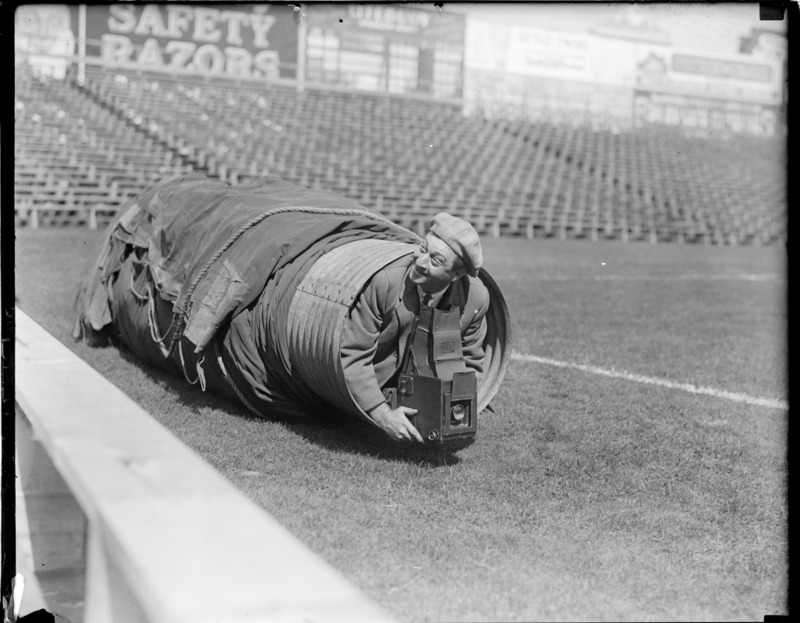 The ‘camera man’ is Leslie Ronald Jones of Digital Commonwealth’s extremely popular Leslie Jones Collection from the Boston Public Library. The Patriot Ledger highlights photos of interest to their readership, like shipbuilding in Quincy. 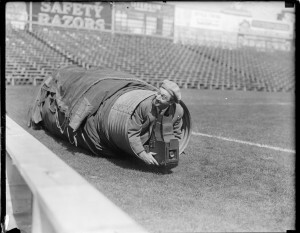 But even they could not resist one of Jones’ more humorous Fenway Park photos – Jones himself with camera emerging from a tarp rolled up on the field. There really wasn’t anyplace he wouldn’t go for a good photo! I have no idea who Minnie Avery is or why she rode her bicycle out to the road between Lenox Dale and New Lenox at the turn of the 2oth century. It is enough for me that someone captured it on film. My first question is, “Why is Minnie Avery standing in what looks like a large saucepan on the side of a dirt road surrounded by trees?” There are even logs under the “pot” that could be lit for a cooking fire. More questions naturally follow: Is the photographer responsible for this Minnie stew? Did Minnie know what was in store for her when she put on her straw boater and summer finery to go riding in the Berkshires? Why is no one named Minnie anymore? Thanks to Digital Commonwealth’s wonderful zoom utility, I can click on the magnifying glass and get a closer look without losing any resolution. Now it’s a whole new – and, alas, less interesting – story. Minnie is standing on the far side of the vat, not in it. She is holding a cup or tin of some sort and there is a pipe – not a handle – on the right. Apparently, this is a drinking station, possibly from a local spring. Minnie has biked out to a scenic spot and stopped for refreshment. The box on her handlebar may be a picnic lunch or her own box camera. Perhaps, she will be the photographer of her companion taking the next drink. All we know for sure is she has nothing to worry about from local cannibals. If you have a favorite photo as deserving of A Closer Look as Minnie Avery and her bicycle, please let us know. Send your Closer Look or a link to your photo to outreach@digitalcommonwealth.org. Posted in A Closer Look. This month we welcome AgitArte, an organization of working class artists and cultural organizers, who added the scroll, one of their community art projects, at left. Almost unbelievably, the Medford Historical Society & Museum has added several hundred more Civil War photos and the Chicopee Public Library has allowed the harvest of two more collections. As last month, I want to highlight one of Digital Commonwealth’s mainstays, the Boston Public Library. The Press Photography from the Brearley Collection has grown exponentially. The 1,222 items added this month nearly double the size of the collection. 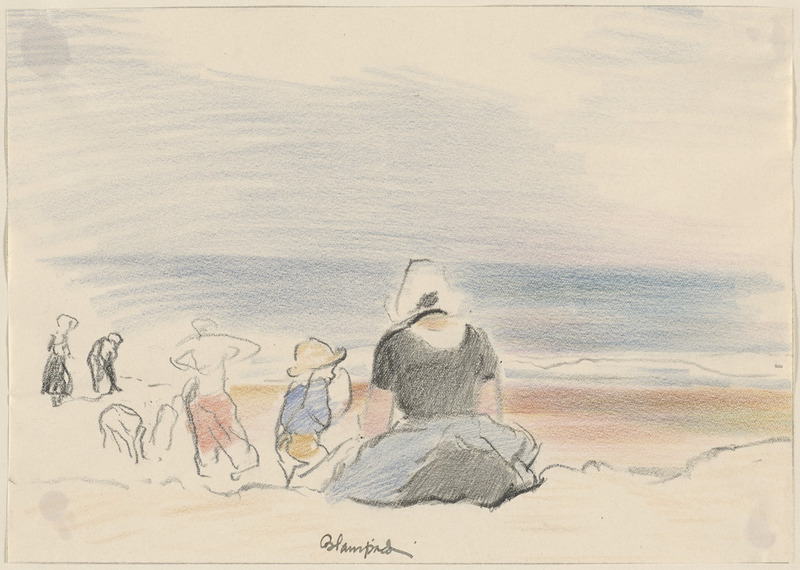 The BPL also added a new collection of 394 items, the Edmund Blampied (1886-1966) Prints and Drawings collection, which includes the exquisite crayon drawing, Beach Scene (10) below. Agitating for the community or a virtual beach visit may warm you up this December. Happy holidays to all! Sometimes when I write these blog entries, I mention in passing that, ho-hum, the Boston Public Library or UMass/Amherst have added – again – to their extensive holdings. I like to shine the spotlight on the little guy, like Northfield Mount Hermon or the Sandwich Town Archives. Then I see this month’s addition by UMass/Amherst of two – count ‘em, two – collections totaling 9,135 items. Wow. Words fail me. 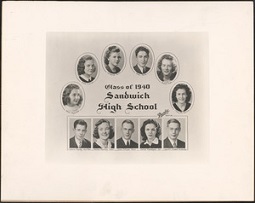 In the meantime, even if you didn’t attend Sandwich High School, you should enjoy a look at the class photos from the 1940s-1970s. (See left.) It is interesting to note the growing population and, always, the change in hairstyles and fashion. If you follow this blog, you know that I love a good map and the Massachusetts Archives has added more town plans. The plan of Monson by Aaron Bliss is jarringly colorful. (See below.) Once you zoom in, it looks like a town plan. In the thumbnail, I keep thinking abstract expressionism. Very Picasso. While the earliest advertising cards first circulated in London, Lyon and Paris in the late 17th century, advances in color lithography and printing in the 19th century made them easier to produce and more ubiquitous. Everything from soap, thread, perfume, hats, shoes, coffee, candy and more were marketed in these stylized cards. Digital Commonwealth has more than 3700 unique images in its collection. 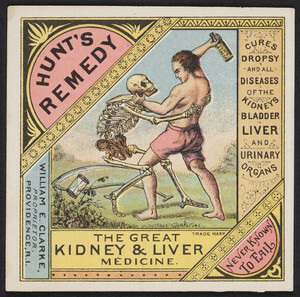 Some of the most entertaining and possibly alarming, cards were for tonics and health remedies that might belong in the annals of medical quackery. Blood-purifying agents were all the rage. 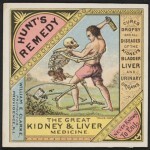 Hunt’s Remedy (above, left) claimed that it was“never known to fail” and cured dropsy (edema), liver, bladder, kidney and urinary problems. It was produced by William E. Clarke of Providence, Rhode Island. The graphics show a shirtless man fighting off the Grim Reaper. Boasting of health and sunny hours, an Ayers Sarsaparilla (above, center) card from 1902 featured a lovely woman in Victorian dress holding a tot on her shoulder. Dr. J.C. Ayers operated in Lowell, MA. Sarsaparilla root is still used today in some herbal medicines to treat psoriasis and rheumatoid arthritis. 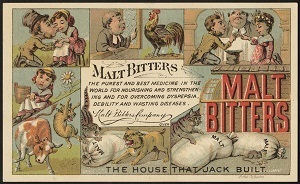 Touting itself as the “purest and best medicine in the world” for overcoming dyspepsia, debility, and wasting diseases was Malt Bitters of Boston, MA. (above, right) Their detailed card also promised “stimulation without intoxication.” Playing off the theme of the House that Jack Built, the card has charming artwork, attractive lettering and tells a complete story. In time, radio ads were a more modern means to reach a larger audience and trade cards fell out of fashion. Larger companies still produced catalogs and smaller enterprises converted to smaller business cards and matchbooks. To see the complete collection of 19th Century American Trade Cards, begin here.